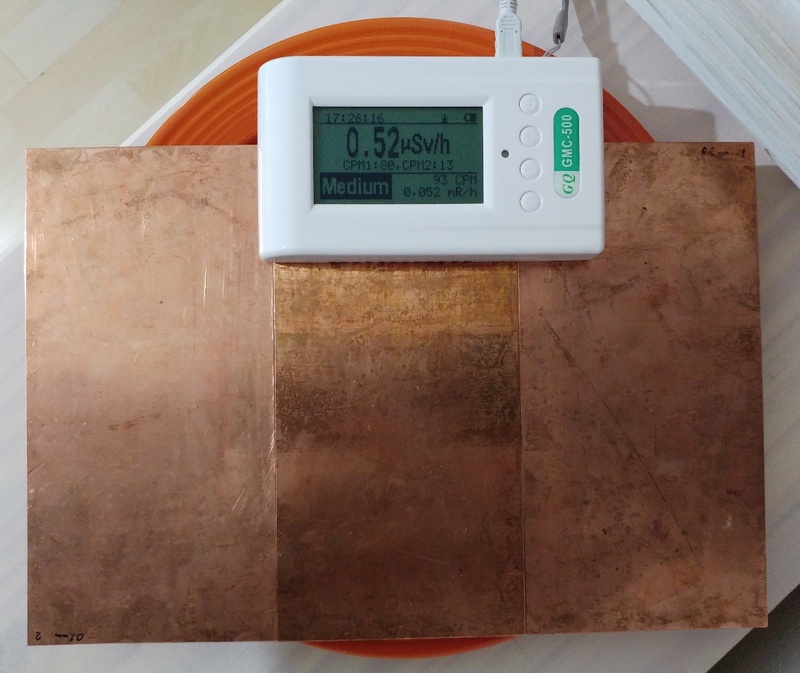 -	Setup1: 6 mm thick copper busbar shielding the uranium glazed plate (the plate is not flat, so the busbar is at about 10 mm from the surface of the plate). -	Setup2: No copper busbar, the GMC-500+ is sitting on the surface at a distance of less than 3 mm. -	Setup3: No copper busbar, the GMC-500+ is sitting on the surface at a distance of less than 3 mm, but with the plate rotated so the tube 2 should be marginally more exposed than before and tube 1 marginally less exposed. Please, do your magic when you find time. The 2nd tube seems to be reacting to the high radiation, but not as expected by far. I think it is much less sensitive than expected! For 5000 CPM in the first tube, the second one should be reading about 160, but it is reading around only 16!!! I understand that the calibration of tube 2 (0.194) is just wrong or maybe very different with beta than with gamma radiation. Until I can put the counter in a "pure" gamma field (which I should be able to do at some point), I cannot say that for sure. Please, tell me if you need more recording time. I do not want to reduce the life expectancy of the sensitive tube by doing these experiments too much. Well, now we get some data with real Pfupf (a Swiss-German word I like very much; self-explanatory in the context ). And it shows again, the claimed 30fold difference between the tubes is wiiiiide off the mark! The different phases of the experiment are easily recognizable in the data, see the picture. As there is such a big difference in the count rates, a log-plot as shown on the right, helps. The 1st tube is the standard tube (cyan), CPS is the from the 1st tube (magenta) and CPM2nd is the 2nd, low sensitivity tube (light blue). This increases the counts from about CPM=20 background to about 100. Not much of gammas coming from the uranium chain. With the busbar removed, and thus leaving through the betas, the counts go wild up to well above 5000CPM. At the gamma-only setup the 2nd tube reached a max of 3CPM - it cannot be excluded that none is coming from the gamma, and all is coming from the tubes's internal (false) counts. This 2nd tube is clearly responding to the betas as seen after ~36min with a max of CPM=17. If the three curves were plotted in units of �Sv/h, they should all be overlapping and form a single curve. Separated in the next picture for the gamma-only setup on the left and the gamma+beta on the right, you see this overlapping is about right. and doing a few calculations we see that the calibration factor for the 1st tube is the well known 0.0065 �Sv/h/CPM. the calibration for the 2nd tube applied here is 33.22 / 10.72 = 3.1. And NOT the 0.194 as claimed by GQ! This 2nd tube is not 30fold, but 3.10/0.0065 = 477fold less sensitive. While this is mostly on beta, the gamma situation is not better: however, there are huge statistical uncertainties, it might well be that the gamma response is even worse than the beta response. This SI3bg tube has a chance of a snowflake in hell as being "only" 30fold less sensitive. GQ, go, find your data to prove YOUR claims. This is so grossly off, my guess is, you never had any data. Prove me wrong. GM tubes. Following are data that I have for these GM tubes. Does this at all give an indication of tube output in CPS per R/h, and have bearing on the counts we're seeing in this thread? I purchased this device to get the benefit of high sensitivity for background, and low sensitivity for nuclear incident response. I don't care about transition, only that calibration of each tube is correct. Now it appears that with next firmware I can get those measurements separately so I'm pleased. GQ has provided their understanding of what calibration is. If actual user data shows that to be off, then it also appears that GQ has provided owner ability to address and correct. This kind of feedback will improve the product for all and add to the usefulness of a rather unique dual purpose product. Thanks for comments on pulse rate above. Given that the pulse rate does have meaning for this tube and using 210 pulses per second, 1 R/h rate is 12,600 CPM. If linear response, the rate per mR is 12.6 CPM. A mR is roughly 10uSv so from this data sheet for the SI3BG, the conversion factor for the tube should be 10/12.6 or .794. .794/.0065 = ~122 so 4x less sensitive than current conversion factor shows. Thanks for the analysis, ullix. It looks like the second tube sensitivity to gamma is very different than to beta. In my next experiments I will focus in that direction: I�ll try to shield all the betas and measure for a much longer time, so the statistical error will be smaller. If you have any suggestion, I am more than happy to hear it. However, it seems that the radiation that I have available (for now) is not enough to trigger the tube 2. We�ll see. Could you show how do you calculate the calibration factor of the first tube using my data without any other reference? I mean, how do you calculate the 0.57 uSv/h from the 87.29 average CPM in tube 1 without knowing the calibration factor? I think that GQ Electronics has created a great piece of hardware, and I also agree with ullix in that it does not seem to be thoroughly tested before release. Especially there is a big ignorance in how the SI3BG tube behaves. That being said, I have never found a company that pays so much attention to users� opinions and actually helps us to be part of the improvement process of the device (for the benefit of both them and us, obviously). With the new firmware we will be able to customize the limits for the �auto range� combined mode and read the data from only one of the tubes at once, making a very flexible device for advanced users. 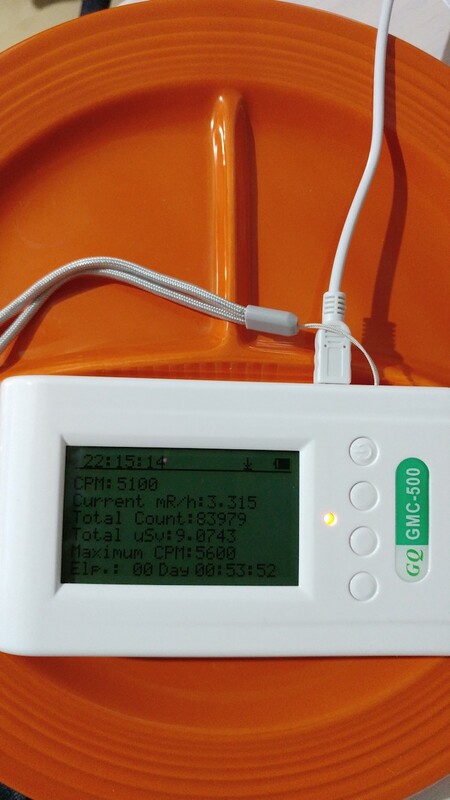 But not all the users are so advanced, and I am not sure that, in its original state before all these firmware changes, the GMC-500+ would have given any benefit in low or high radiation measurements for the average user vs. the GMC-500. At least when based on the given numbers (can you please provide a link to these numbers?) I come up with the same. Based on the referenced numbers the ratio to the M4011 is 109...137fold for Gamma. Though it also is not specified at whcih gamma energy. That can make a multi-fold difference. In his experiments user the_Mike has also found a value well above 100fold, but again, it is unknown how the differences beta/gamma are. Sorry for misleading you. 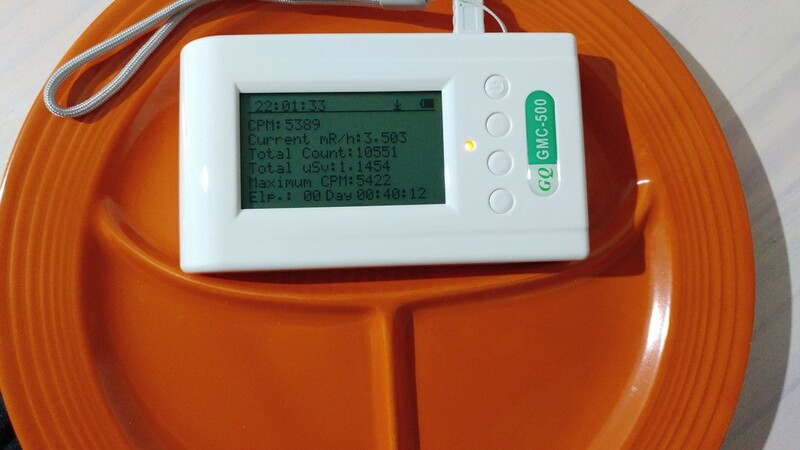 The calibration factors are implemented in GeigerLog but are configurable for every user. So I put in the default of 0.0065 �Sv/h/CPM for the first tube - the default so far always used for M4011, SBM20, SBM5 and what have you. The second tube has a default as stated by GQ as 0.194. Though, once I had seen that this is nonsense, I customized GeigerLog to use 3.1 instead. Yes, 16fold higher! I tried to guide the reader from seeing that the 3 curves did fit in the graph to the data to calculate back and find out what I had to have done in order to achieve the fit. And that is to divide Avg=33.22 �Sv/h for the 2nd tube by Avg=10.72 CPM to come up with 3.1 �Sv/h/CPM, the number I had to put in manually in order to get the fit. As we see in our experiments, it is anything but trivial to come up with a RELATIVE calibration of the 2nd tube re the 1st, let alone ABSOLUTE calibration of either tube. This shows sensitivity of at least 2*10E-5 pulses/sec (282 Rntgn/hr), but not sure how to take that. This is a post to Geiger Counter Enthusiasts Yahoo Group. Not sure where he/she got data posted. I have a few of the old Thorium laced Coleman mantles in original wrapping. Three packages of two stacked with detector on top gives 4700 CPM from tube 1. Times .0065 is 30.55 uSv/h. Tube 2 reported 14 CPM and to give same 30.55 requires conversion factor of 2.18, not the factor I calculated from the tube specs and 2/3 of what ullix reported from the data ikerrg provided. Thorium seems to generate lots of alpha and beta like uranium. That is why your results are close to mines, and why the tube data you found (which is for gamma) is far off our results. I have to try with pure gammas/xrays. That's interesting. I just received a CD-V 717 field/survey meter and it uses an ionization chamber detector. The Coleman mantles don't move it at all from background. I guess the ionization chamber responds primarily to gamma. Try shielding the betas with something that creates Bremsstrahlung#8203; (like thin copper) and you might be able to measure the Xrays (depending on energy). An ionization chamber would measure everything that gets into it, albeit with lower sensitivity than a Geiger counter, as it is lacking this avalanche enhancement of the latter. Th should certainly give a signal, both on the betas as well as on the gammas; Th gives much more beta than gamma. If you get nothing at all even after prolonged exposure, then the chamber is probably defect. Why do you believe it is intact? Don't know that it is intact. I just bought on Ebay and zeros fine and circuit check works. It indeed may not work due to bad chamber. Don't see any corrosion and meter looks pretty unused. I am checking my few sources to see further. Well guys, here is a new experiment with the uranium plate that has given me some confidence on my brand new GMC-500+ and that makes me quite happy. However, do not hesitate to tell me what could be wrong in my experiment or my assumptions. 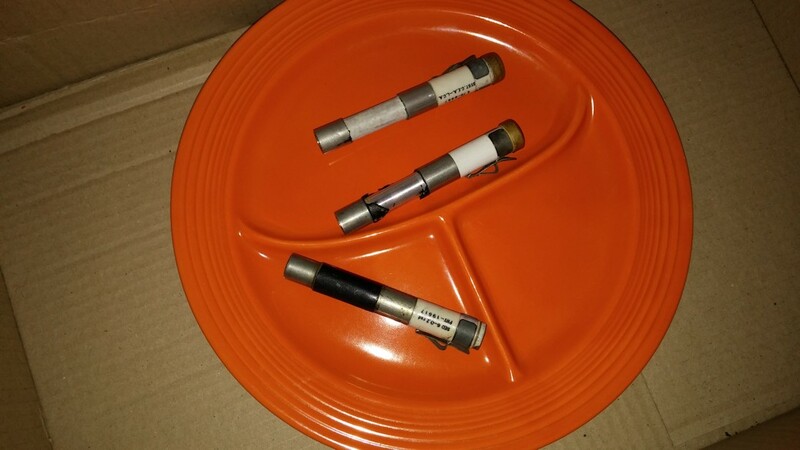 I have three very old pen dosimeters from the 1970�s (from when my father worked in a nuclear power plant), and they have not been used or calibrated in more than 40 years. They do not require any kind of power/battery to operate (so I suppose the particles charge something inside that moves a needle a little bit each count) and obviously you cannot see the instantaneous dose rate (they are just dosimeters). The dose can be seen visually through a small window and some backlight. They can accumulate a dose of up to 0.2 rad. For beta or gamma radiation, 1 rad is equivalent to 10 mSv. I do not know what kind of radiation were meant to be measured by these dosimeters, but I can assume that it is mainly gamma (although they should be able to detect the beta dose rate). 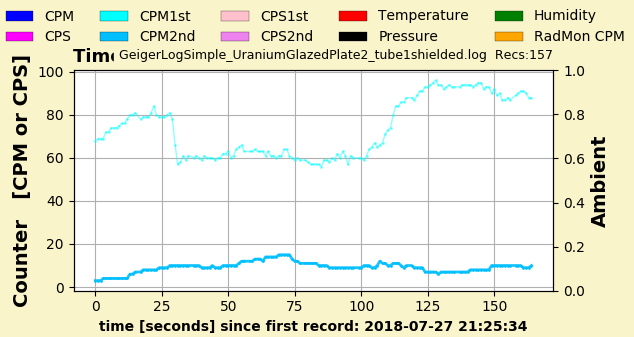 I have exposed the dosimeters to the surface of the uranium glazed plate (see the picture), and I assume that only betas and gammas are crossing the vitrified cover of the plate and the shell of the dosimeters. So the setup is very similar to the one that I did with the GMC-500+, but here the dosimeters are a bit closer to the surface of the plate (the GMC-500+ has a plastic enclosure that limits the distance and can filter some betas). 0.105 rad = 1050 �Sv (for beta or gamma radiation only). Therefore, the average dose rate at constant radiation is 1050/21.8333 = 48.1 �Sv/h. If you see the data that I presented before using the GMC-500+, I measured an average of 5450 CPM in setup2 (maximum possible exposition of tube 1). Using the conversion factor of 0.0065, that is equivalent to 35.43 �Sv/h. THIS IS AMAZING!!! Clearly the result is not identical, but given the different distances and the age of the dosimeters, the result is very encouraging about the behaviour of the M4011 tube and the old dosimeters! That says nothing about the tube2, but that is a different problem. 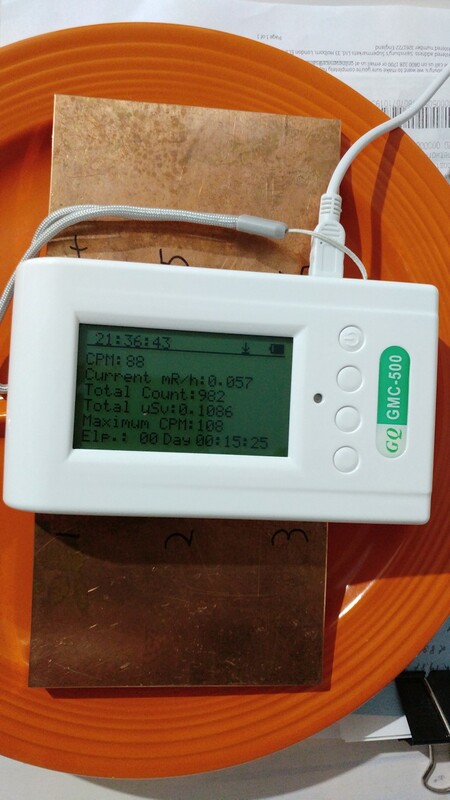 If you do the calculations again using the last dosimeter (0.047 rad), the result is much smaller: 21.53 �Sv/h. I cannot know if the problem is that the dosimeter is broken (it actually looks bad, like it had been dropped) or if the black rubber cover is shielding more the betas (and that cover was rotten a long time ago and disappeared in the other two dosimeters). In summary, this is a beautiful confirmation that the GMC-500+ (and any other one that used the M4011 tube) is actually returning a pretty good value of the dose and dose rate. I hope I can continue testing the detector in new experiments, especially if I can have access to a high gamma field. CD-V 717 is a survey meter. Dial calibrated in R/h. The stack of Coleman mantles puts out 4-4.5K CPM on tube 1 of GQGMC500+. That's a little over 2.5-2.7 mR/h. With the knob set at .1X on the 717, major divisions are 100 mR/h. Each tic in between is 10 mR/h. These measurements are at the bottom end of the scale in essentially that area you cannot trust the readings. When you pick up and move the meter the needle moves a bit and then has to settle. With all that said I think I might see the movement of the needle about one partial 10 mR/h division. And slight movement back when I move the meter away. But again, this is simply not the environment this meter was meant to perform in. I think it is working, but to be sure I will likely send it to a place in Texas where they have all the old calibration equipment of Civil Defense. $92 to calibrate this meter, and probably worth it to see if it truly is working as is should. 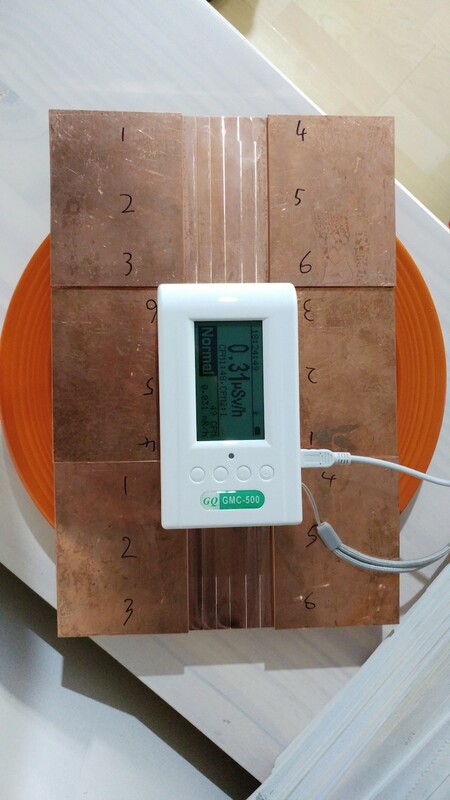 Following ullix�s advice, I have covered the uranium glazed plate with 3 copper busbars (instead of only one that I used in the previous setup1), to shield the counter from the few alphas that manage to go through the glass cover and from the massive amount of betas. In this setup, the tubes do not have any direct sight of the plate surface, so no particles/photons can hit them without being filtered by the copper. The log of data has been done using the new version of GeigerLog simple, and for a longer time, as the radiation measured was not wearing out the sensitive tube too much. After about one hour (not exact! ), I saw that the CPM was very low (only a bit more than twice the background) compared to the other day tests, so I added a bag of KCl on the top of the counter (see the pictures). Almost nothing changed in the readings, and so I understand that the gammas of the KCl are not reaching the tubes having to cross the whole detector. What is concerning to me is that the tube 2 does not notice anything at this level of �only gamma� radiation, and you can only measure noise. I think ullix is right and the sensitivity of that tube is extremely low in general (to betas and gammas), and it is so far from the sensitivity of tube 1 that it makes a combination not optimal at all in the same counter. If the ratio of sensitivities is close to 3.1/0.0065 = 477, there is a big gap in the radiation range that the device can measure, where none of the tubes is either sensitive enough or not too saturated to measure. The new firmware allows more flexibility to use each tube separately and get better readings, but a tube 2 with lower sensitivity than M4011 and higher than 3.1 (like the advertised 0.194) would have been perfect. Do you know of any tube like that that could be fit to the GMC-500+ PCB? Now the number of events in tube 2 is comparable to tube 1, and therefore you can see both tubes working (although they are obviously not in the same radiation). However, tube 1 seems to increase the CPM, while it is still being shielded. I need to do this again! There is nothing new in the first data set. After 10min of background I see no further change occurring. 2nd tube is max of 3, 1st max of 55, ratio of the averages about 100fold, again way beyond 30fold. And you won't stop them with Geiger counter case or with your busbars! 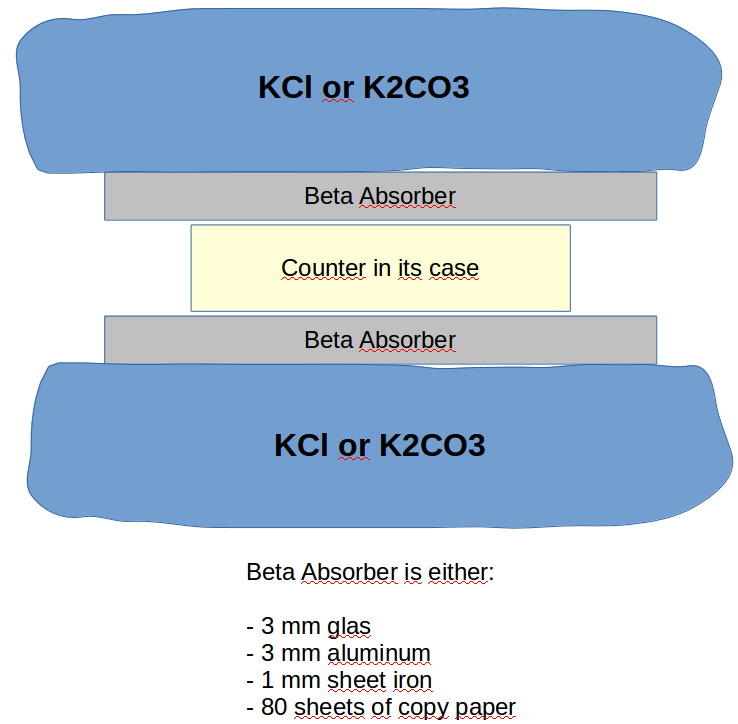 It is just that the K40 decay is 9:1 in favor of beta, and the efficiency of a tube perhaps 30:1 or bigger in favor of beta. When I "wrap" my tube with 2 pounds of K-salt, I get up to ~400CPM. Shielding the betas brings it down to well under 100. Problem is, you can take K-salts to give the SI3bg tube some beta-workout, but it tells you nothing about the gamma sensitivity! You are right. It seems that the name of the pictures uploaded to the forum matters! I repeated the name in the last ones. Now it is fixed. The ratio of the averages in this case is not very precise, as the measurements of tube 2 are just noise because the radiation through the busbars is not enough to excite tube 2. That is why the ratio is so low. The measurements in the first post of this thread showed a ratio probably much closer to the reality, i.e. the 477 that you calculated, but mainly for beta radiation. In any case, that is outrageous! 3.1 instead of 0.194! And for gamma it might be bigger. Therefore, the second tube is almost useless with the default sensitivity (0.194), and there is a gap in the radiation intensity that the GMC-500+ can measure (when tube 1 stops working and tube 2 is still not sensitive enough). I hope I can find more when I am able to put the detector in a big gamma field. Anyway, that problem is only for tube 2. In message #15 of this thread I compared the response of the M4011 with some old professional dosimeters, and I am quite happy to see that the result aligned pretty well to what the GMC-500+ was reading (using the 0.0065 calibration with mainly beta radiation!). That means that the 0.0065 calibration of M4011 tube is good also for betas! Yes, it is true, there is a big variation, but I didn't move the setup. However, it is a very short time. I am repeating this test properly and with pictures, so we can see the detector response in an inhomogeneous field. I agree, we need more gammas to make tube2 work. If you think that there could be a setup to convert the uranium betas to xrays and that the setup would create enough xrays to excite tube 2, please tell me. Thanks for your analysis, ullix. So here it is, the last experiment with the uranium glazed plate. I�m trying to drive the tube 2 only by shielding tube 1 as much as possible, and then get both readings using the latest version of GeigerLog_simple. The setup can be seen in the picture. 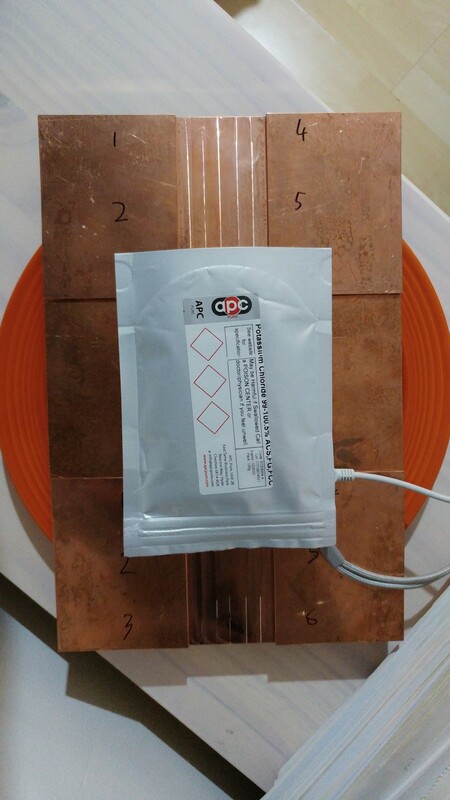 The detector is hanging at the front where tube 2 is (direct exposure to the plate surface), and the 6mm copper busbar is shielding the tube 1. Even with the shielding, the tube1 is counting many more events than the tube2, and also many more than with a full shielding of the device (shown in post #17), which indicates that the tube1 is �seeing� the surface of the plate slightly, and it is still getting some betas (tube 1 has an average of 84 CPM vs. 35 CPM when the counter is fully shielded). Even with this setup, tube2 barely catches an event, with an average of only 8 CPM! Here the ratio between both tubes makes no sense, as they are inside a different field. I don�t know if you can conclude something else, ullix. On the M4011 we see 5000 CPM without shield, and ~35 with shield. Unfortunately we don't know the ratio of beta to gamma in the Uranium decay chain, and we can't determine it from the data. The sensitivity of Geiger tubes tends to be approaching 100% for beta, and around 1% for gamma, but with an upper end of perhaps 5% and a lower perhaps well below 0.1% (see the docs in my sourceforge folder 'Supporting Documents'). It might well be that the 5000:35 ratio is all due to differential tube sensitivity to beta and gamma; at least most will be. The M4011 is at least in the ballpark of decent tubes. It is unlikely that another tube, like the SI3BG, will have a drastically better beta:gamma ratio, i.e. meaning gammas will not be detected relatively better. But may well be detected worse! In your mix of beta and gamma (i.e. in your unshielded experiment) the tubes again show a ratio M4011:Si3BG of about 5000:10 = 500, confirming earlier results. I'll let me be convinced from data ( D A T A, like : facts ) showing otherwise, but until then I'd say the 2nd tube is worse 500fold, if not by an even higher number! That tube is a dud in this usage. The shield in the gamma experiment will be your busbars, in the beta+gamma experiment they are replaced with e.g. (corrugated) cardboard of the same thickness just to assure same geometry. KCl recommended (K2CO3 also ok, but as both are slightly hygroscopic, the latter forms a lye, the former "only" a salt solution. Thanks, Ullix. I'll see what I can do. I cannot find KCl in the UK so cheap as yours (neither in eBay nor in Amazon), as I need at least 1 kg. And I still have concerns that the KCl radiation is not high enough to be able to see anything but noise in the Si3BG tube. I'd like to find another tube less sensitive than the M4011 but better suited to be combined with it. Now that the firmware is customizable (the calibration of the second tube, I mean), maybe we can improve this detector doing a bit of DIY.